It’s been a busy time here in the Campbell + Green world so where to start? Since last we wrote we’ve toured 6 weeks across Europe, 10 days across eastern Canada and 1 week in BC. We’ve sold a house, almost bought a house, had a visit with Mom, got a nice review from ‘The East Mag’, started recording Christmas songs, played a festival and a concert or two and have more shows coming up, here in Nova Scotia! December we’re in Vancouver! Check our calendar, Dates are booked and more are being added. If you know friends near the shows, let them know. We are always up for playing house concerts and listening venues, so if you would like to host or have a favourite venue where you like to listen to music, please let us know. We’re moving! We have sold our house so we can downsize and ‘minimize’ and have a simpler life. It will make touring a little easier too. The old big house was, well, really big. 3700+ square feet on an acre of land is more work than we wanted and we are okay with letting our 60 seat home venue go, too. Not many folks wanted to drive 15 or 20 minutes out of downtown Dartmouth or Halifax as there was so much more for them to do closer in. We love doing hosting concerts but it’s time to focus on our upcoming projects. We are currently staying with our lovely artsy friends, John & Brenda, in Lower Sackville, as we search for a mini-home somewhere in the region. 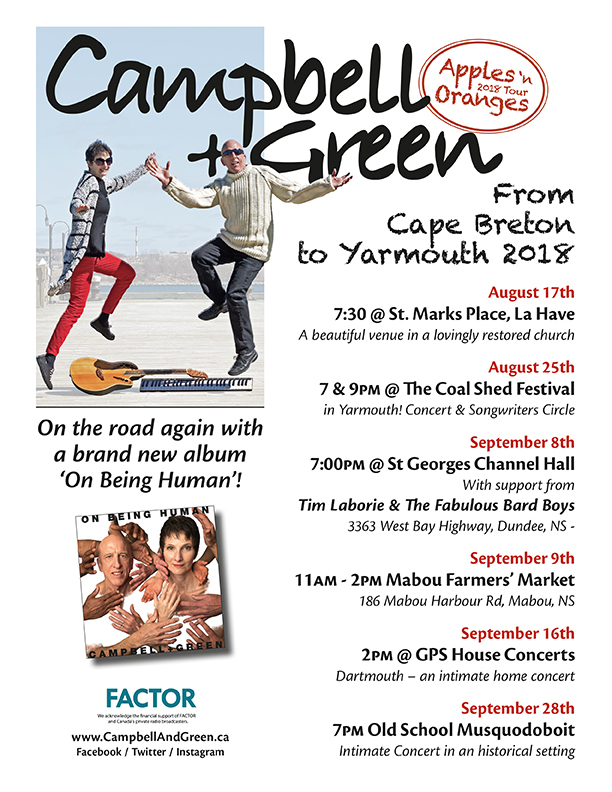 Nova Scotia duo Campbell & Green have released their latest album, On Being Human. Inspired by their tours across Europe, Canada and the human experience itself, the folk posse of Robert Campbell and Cailin Green address life’s highs, lows and everything in between. The duo are excellent conduits of the folk genre who aren’t afraid to play with different sounds to fit their ideas and themes. Their trusty guitars and pianos do most of the heavy lifting alongside their versatile voices, but every now and again they’ll squeeze in a cheeky keyboard synth or concertina chime to add more emphasis on the diverse amount of vibes that each track offers. It addresses life’s highs; from the bouncy, wholesome, feel-good love song “Sound Of You” to the less-bouncy but equally wholesome “He Won’t Give Up Til I Smile.” The duo expertly weave together guitars, pianos and smooth vocals to result in lovely little reflections on the things and people we love. They also don’t shy away from the more sensual representation of such a high with “A Love I Never Knew” utilizing new sounds in a very mischievous melody. It addresses life’s lows. “Crushed My Beating Heart” is a much more sombre, depressing exploration of what happens when love doesn’t work in favour of the people involved. “Broken Innocence,” meanwhile, outlines the tragedy that is growing up and realizing that the world can be a pretty cruel place. Interestingly, the majority of the tracklist spends time reflecting on middle part between the highs and lows of life. “Fault Line” acknowledges the inevitability of mistakes alongside a much more old-school country vibe. “I’m Only Human” does the same, but with extra emphasis on the “I make mistakes, but that’s okay” message, which goes hand-in-hand with the gentle ebb and flow of the track, as though they want us to be gentle on ourselves. Finally, “Heaven’s Company” introduces us to the most enrapturing piano melody yet, and has listeners reflect on the collective impact of our lives on those of others. “Will It Feel Like Home” then takes our understanding of the human experience and flips it on its head. In a very clear message of unity to refugees who are escaping their war-torn homelands, the two musicians use very full-sounding keys and vocals to not only assure refugees that they will be safe here, but also to remind us other listeners that the human experience can be very frightening and that we can all benefit from standing together and impacting each other positively.